So I spent an afternoon traipsing around the city shops of Melbourne in search of two particular books. I asked at the desks and eventually conceded that these two titles were not currently available in print. Neither were old or obscure titles. I want to support local businesses in preference to large multi-national companies that monopolise the market. Alas this was not possible. The next day when seated at my desk with blisters on my feet I quickly and easily and cheaply downloaded the two ebook versions onto my iPad. 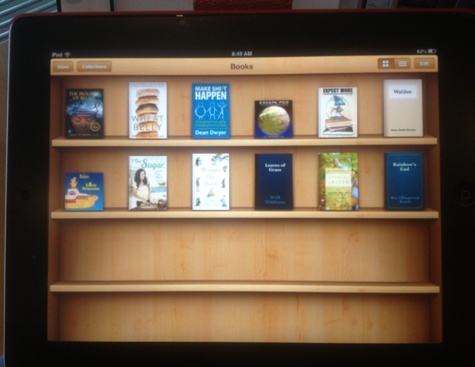 I find that my eBook shelf is gradually filling up (if that is possible?!) Talking with colleagues at work, who share a love of books, reading, and techno-gadgets, we compare our eBook experiences. One person deletes the books she buys after she has read them assuming they remain on her invisible purchases sitting in ‘the cloud’. None of us seem to mind what format the book is in, and ultimately it is all about the content and getting our hands on it when we want it. This entry was posted in Uncategorized and tagged availability, book shelf, book shops, books, content, ebooks, Goodreads, online shopping by suesbent. Bookmark the permalink.